The new Imagine Cup Champions ARE … Team X.GLU of the Czech Republic! We are excited to announce Team X.GLU of the Czech Republic as the 2017 Imagine Cup champions. X.GLU’s project is a combination hardware and Microsoft Azure cloud solution designed to help diabetics better cope with the disease’s symptoms. As the victors, X.GLU wins a mentoring session with Microsoft CEO Satya Nadella, $100,000 in cash, a $125,000 Azure Grant and a trip to the 2018 Build developer conference. In 2010, Abiola Olaniran won the African Imagine Cup. Today, he’s one of Nigeria’s highest paid game developers. Since competing in Imagine Cup 2013, Matibabu of Uganda has since raised $100,000 for its malaria diagnosis app. First built at Imagine Cup 2008, the WhereIsMyTransport app helped alleviate traffic congestion in South Africa and raised the interest of investors. In 2014, Team Eyenaemia built an anemia assesment app and won the Imagine Cup Championship, $50,000 and a meeting with Bill Gates. Kobojo began their journey making Facebook games at Imagine Cup 2008 and have since raised $6M USD in venture capital for their startup. The new Imagine Cup Champions, X.GLU of the Czech Republic, hoist the Imagine Cup trophy to celebrate their victory. Microsoft Executive Vice President of Cloud and Enterprise Scott Guthrie and Imagine Cup Master of Ceremonies Kate Yeager congratulate the new champions, X.GLU of the Czech Republic, on their victory. The Imagine Cup Championship judges – Black Girls Code founder and biotech industry veteran Kimberly Bryant, Harvard computer science professor David Malan and Microsoft Azure CTO Mark Russinovich – confer during the Championship Show. Human beat box phenom Blake Lewis warms the crowd up before the start of the Imagine Cup Championship Show. Hit recording artist and Seattle-area native Macklemore comes on stage during the Championship Show to provide the final four teams with a few words of encouragement. They made it! The Final Four teams – Nash, NeuroGate, Oculogx and X.GLU – pump their fists with Imagine Cup World Finals Master of Ceremonies Kate Yeager on July 25. Members of Team Farmalytics of the U.S. show their powers of concentration at the Azure Machine Learning Challenge on July 25. Team Sense+ of Hong Kong consult on the best way to approach the Azure Machine Learning Challenge on July 25. Team Welse of Thailand competes for the prize at the Azure Machine Learning Challenge on July 25. Barbora Suchanova presents Team X.GLU’s hardware / software solution, which is designed to better help diabetics cope with their condition. X.GLU is one of the final four teams that will compete for the Imagine Cup Championship. A drone sits on a table as Team Nash takes questions from judges on July 25. Nash made the cut of final four teams competing for the Imagine Cup Championship. Wenqi Xian explains Team Oculogx’s virtual reality app, which uses HoloLens and Azure to improve locating items in warehouses. 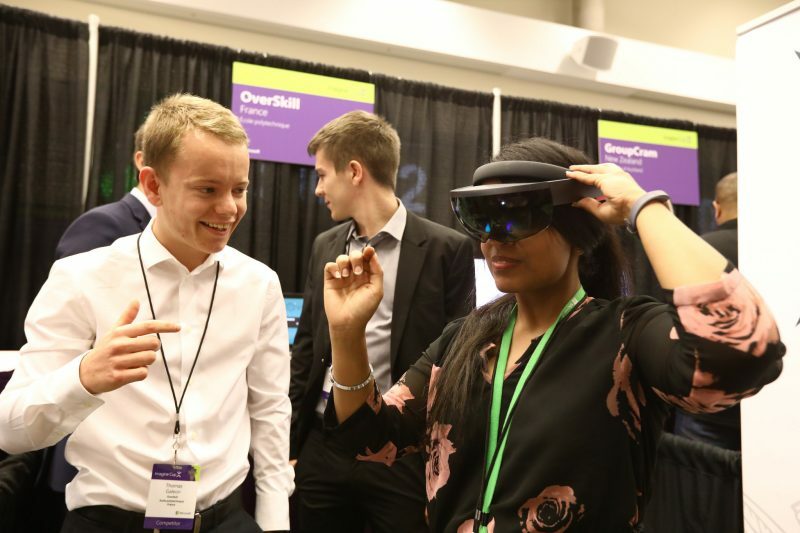 Oculogx was one of four teams to proceed to the Imagine Cup’s final four. Team OsteoMentor of Greece is elated at the announcement that it is one of 10 Imagine Cup teams to qualify for the Semifinals round on July 25. Team Opticode of the Philippines cheers on July 25 at the news that it has moved on to the Semifinals round. Team X.GLU of the Czech Republic celebrates making it to the Semifinals round on July 25. Roman Krivonogov of Russia’s Team Evermind presents to Imagine Cup judges. Evermind was one of two previously eliminated teams voted back into the competition during the Wild Card round on July 25. Echo Innovators was the second previously eliminated team to be voted back into the competition during the Wild Card round on July 25. Negative Time of India makes its presentation before the judges. The team advanced to the quarterfinals round July 24 with Content Holmes, a one-click AI-based online parenting solution designed to protect kids from cyber-bullying. Upfish of Brazil gets ready to present to the judges on day one of the Imagine Cup World Finals. Team Nash of Argentina celebrate making it through to the quarterfinals round on July 24. Members from Team NeuroGate of Canada beam with satisfaction upon learning they had made it to the quarterfinals round on July 24. Thomas Galeon, a member of Overskill of France, helps demonstrate his team’s project, which is designed to train the mind and the body simultaneously using mixed reality. Hanoi Alexa Gonzalez Talavera, a member of Eranoi of Mexico, gets ready to present to the judges on day one of the Imagine Cup competition. The members of Team Pocket Sized Hands take a break from the serious business of Imagine Cup competition. Beta Team’s Alya Alshanfari performs a demo of the “Bee” app, which is designed to enhance the customer experience at retailer stores. Beta Team hails from Oman. This year’s Imagine Cup World Finals teams have arrived! The students took some time to pose in front of the Seattle skyline on Sunday, July 23. The Imagine Cup World Championship trophy is waiting to be claimed by one of 54 student developer teams that have traveled to Seattle to participate in Microsoft’s global student technology competition.